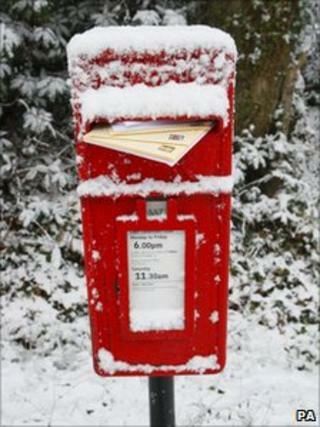 The ghost of Christmas presents appeared to haunt much of the UK on Monday, as the frozen conditions disrupted postal deliveries and shopping efforts. Blocked roads and heavy snowfalls across the country meant shopper numbers were down and freight disrupted, while delivery companies issued advice on whether orders would arrive before the Christmas weekend. The winter conditions also spelled trouble for farmers whose winter crops - bound for festive dinner tables - remained in the frozen ground. One day before the last first-class posting day, Royal Mail workers were into a second day of 14,000 extra delivery rounds, to try to clear the backlog. Evening and Sunday deliveries were part of a £20m investment in additional measures to deal with fall-out from the most severe December in almost 30 years. Deliveries to the parts of the UK most severely affected by the weather were the priority with additional HGV drivers and 250 large lorries out on the roads. Royal Mail estimated they would have carried out an extra 25,000 rounds by Christmas, in a system that usually sees 68,000 daily rounds covering more than 28m addresses. Meanwhile, online companies continued to struggle with orders as their postal carriers were prey to delays. Online retailer Amazon said it was not expecting items ordered after 18 December to be delivered by Christmas Day. Its website said: "Because of the worsened weather conditions over the weekend, orders placed on December 18 or later may take longer than expected to be delivered." Customers who ordered via a trackable delivery were advised to check with the carrier service delivering their order. But people choosing to do their Christmas shopping in person fared little better - with footfall on the UK's high streets down and roads and shopping centres closed. Figures from retail researchers Synovate showed Saturday footfall was down 24.3% compared with the previous year, with the West Midlands, South East England and London being worst affected. Sunday trading was a little better, as shoppers ventured out after Saturday's storms, but it saw a 13.3% fall, meaning the weekend was down 19.6% compared with last year. At The Mall at Cribbs Causeway, the south-west of England's biggest shopping, near Bristol, one car park, usually jammed in the December rush, hosted just one car on Monday. Snow and ice had made driving conditions on the adjacent M5, and the main Devon link road, the A38, "treacherous" according to police, and many shoppers stayed away. The shopping centre's Jon Edwards told the BBC: "It makes me cry, I have to say. "It's a very important time, everybody works exceptionally hard to make sure the products are there, the staff there. "Everyone's managed to get in, the car park's clear, the roads are there, we just need a few more customers at the moment." The lack of shoppers compounded a bad period for retailers, amid the economic downturn and ahead of a VAT rise to 20% which comes into effect in January. Nick Hood, of insolvency specialists Begbies Traynor, said any deferred sales meant a real loss for retailers as items would instead be purchased in the January sales. Then, retailers may also lose out as they were likely to absorb the VAT increase, rather than passing it on to customers. He added: "The other problem is about 20% of all Christmas spend is impulse and that dies on Christmas Day. You're not going to buy that extra chocolate cake or that extra present for Auntie Flo. You stop." While high-profile business failures were not necessarily on the cards, he said the hardship would hit individual shops and smaller, regional chains focussed in areas where public spending cuts may bite. He said: "It's Armageddon because they cannot get their supplies, so the stores are going to be not properly stocked. "So they're not a safe bet - there will be a flight to safety to the bigger retailer." Away from the pre-Christmas retail rush, the severe weather has caused major problems for farmers, both tending animals and crops. It is the busiest week of the year for vegetable farmers and importers. But many crops meant to be set for Christmas dinner tables were in frozen fields under the snow. One Lincolnshire farmer, Peter Davies, said the weather was having a "devastating impact". Cauliflower and cabbage were rotting, badly damaged by weeks of sub-zero temperatures. Importers were also struggling to deal with the conditions not only effecting the UK, but also much of Europe where produce transportation is proving extremely difficult. In parts of Northern Europe lorry drivers have been told to stay off the roads. It means there may be potential shortages of some winter vegetables well into the new year.